Anyone who follows the stock market can tell you that Friday was a tough day for investors. The Dow closed down more than 400 points and none of the other indexes fared much better. It was only a few months ago when the Dow suffered a similar drop after the British voted to leave the European Union. The Brexit fallout occurred six months after the Dow lost 1,000 points in a single day due to new about China’s slowing economy. All of these point to a skittish market, filled with traders that recognize that the bull market is coming to an end, but don’t want to miss out on gains as markets continue to rise. This begs the question, “can money still be made?” from many beginners and novices who would like to get started investing, but feel worried about the currently volatility and sentiment. The answer to this question is, of course, a resounding yes. There are literally dozens of ways to make money in financial markets that are headed in either direction. Here are a few to consider. The easiest one is obviously shorting the stock market as a whole, or certain stocks. Shorting is basically betting that the price of a stock will go down instead of up. While there is a lot of complicated explanations about how shorting works, it is pretty simple to do and is just as easy as buying shares of stock. Most stock brokers give you this option as long as your account meets certain requirements. I recently wrote a review of Trade King, which is who I use to do all shorting because of the simpleness of their platform and low cost to short a stock. An inverse ETF is another way for someone to basically bet against a certain portion of the market. An ETF is basically an index fund that typically tracks an index. For example, there is an ETF that tracks the price of gold and goes up and down with the price of gold. An inverse ETF basically does the opposite of the index it is tracking. So if the price of gold is going up, then the inverse ETF will go down. There are inverse ETFs for most sectors of the market as well as just the S&P 500. There are even inverse ETFs that will move up to three times the speed of the index they track, meaning if gold goes up 1%, then the 3x inverse ETF will go down 3%. These are extremely risky and should be traded with a lot of caution, but the option is there if you are confident a sector is about to take a dive. The good thing about these ETFs is you can buy them like stocks, so for a lot of beginners that use Robinhood and don’t have the ability to short, they can buy short ETFs and still see the same types of gains. If the first two options sound too complicated or nerve wracking then there is always gold and treasury bonds. These tend to have lower yields then the general stock market, but they tend to fare much better during bear markets or market corrections. The price of gold has dropped significantly during the last five years, but since January of this year it seems to have bottomed out and has made steady gains. This reflects many investors sentiments that gold is a safe haven during potentially volatile markets. 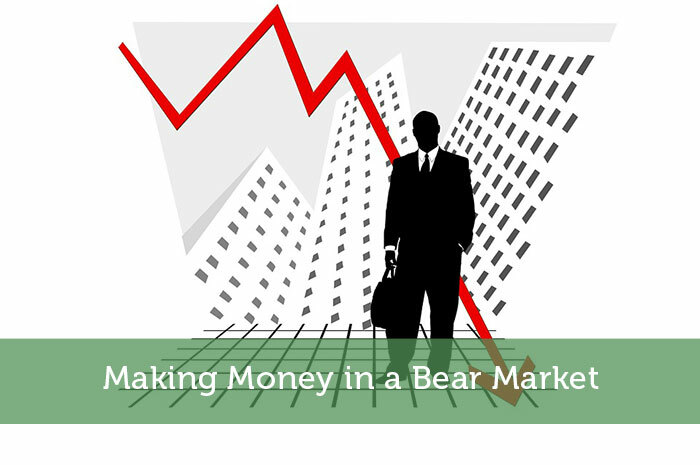 These are just a few ways investors make money during bear markets. A lot of investors prefer just to go to almost all cash and sit out the tough markets. Others will do hedging to stay invested and fight inflation. Whatever option you choose, just know that there are good options.